All frames are welded on a state-of-the-art computerized submerged welding system. We are capable of producing structural members up to 72" in depth, which gives us the ability to manufacture clear-span buildings up to 150 feet wide! A factory primer coating is applied to protect the beams during shipping and erection. All framing members shall be shop fabricated for field bolted assembly unless otherwise noted on plans and specifications. All building parts shall carry an identifying mark for easy field identification. Structural framing shall include tapered beam frames, tapered rigid frames, modular beam and columns, lean-to rafters and columns, canopy beams, intermediate columns bearing end frames and end wall columns. Steel used in the fabrication of built-up primary structural members shall have a minimum yield of 50 KSI. Hot rolled primary structural members shall have a minimum yield of 50 KSI. Cold rolled structural members shall have a minimum yield of 55 KSI. Primary framing shall be shop fabricated and include all holes required for attachment of secondary members and bracing. A continuous arc-welding process shall join flanges and webs of built-up welded members. End wall columns and rafters shall be "hot-rolled" built-up "I" or standard "cee" sections. All field connections shall be bolted. All primary bolted connections shall be furnished with high strength bolts conforming to A.S.T.M. A-325. All secondary bolted connections shall be furnished with machine bolts conforming to A.S.T.M.-A307. Girts (walls) & Purlins (roof): These members run the length of the building providing rigidity, and a sturdy skeleton to attach the sheeting. They are rolled from steel coils 12,14 or 16-gauge steel, or thicker if needed. All girts and purlins are pre-punched for ease of assembly. Eave Struts: This is a rolled member formed into a "C" to match the pitch of the roof. The eave strut is also made of 12, 14, or 16-gauge steel. All sheeting is 26-gauge "R" panel. Color sheeting has a galvanized substrate to prevent rust and corrosion. All our Galvalume roof sheeting is hot dipped with a zinc and Aluminum compound to give it the strength to stand up to the worst weather, and the durability to last for generations. Fasteners: Self-drilling fasteners are designed for rapid drilling without slipping of the drill point, thus reducing walking and surface marring. The neoprene washer keeps your building watertight as well as providing vibration dampening. 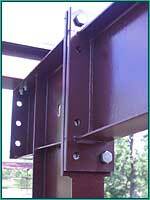 Structural Bolts: We provide all the nuts and bolts to assemble your building through pre-punched holes. Closure Strips: Our Steel Buildings come with closure strips which when installed provide weather tightness. The closure strips are pre-formed to match the profile of the panels. Ridge Cap: The ridge cap is designed to match the slope and contour of the roof providing a tight seal along the ridge of the building. Trim, Flashing, Gutters & Downspouts: All our buildings come with standard trim to give the building a finished clean look. Optional Gutters and Downspouts provide additional protection from the elements. Plans and Drawings: We provide a full set of anchor bolt plans for the placement of anchor bolts in the foundation. We also provide engineered stamped and certified construction prints. In addition we provide an in depth erection manual to walk you through the erection of your building.